The Caption Competition is beloved internet game, which has it origins in the satirical UK topical news quiz; Have I Got News For You. The idea is that someone posts a (Avengers related) picture and everyone can then add their humorous caption to it. * The image does not strictly have to be an Avengers one, but captions should be Avengers related jokes. * Only real pictures are allowed, no animated images or manipulated photographs. * No profanity, no personal attack, etcetera.... Keep it fun and civil. * No quoting of the image you are commenting on! * Give others the time to comment on an image before you post the next one. "Tell me you like my novelty earrings or I'll pump ya full o'lead!" - What do you mean the key is up your bum? - Your bracelets - Cartier?? "I want to know the name of the other woman who has been playing with my handcuffs!" Emma's timing couldn't have been worse. The instant she stepped out of the adult toy store, she was dismayed to spot Steed coming down the street. OMG! And I thought my salami was large! HA HA HA HA! Lmao, Timeless! That was just awesome. I tip my bowler to you. Why thank you! I'm glad someone enjoys my sometimes twisted sense of humour (although that picture's just asking for it, really). 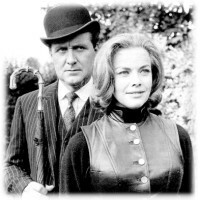 Emma's going to be even more disturbed when Steed casually mentions he inherited one of those from his great aunt Eloise. "Up a bit... down a bit... left a bit... Golden Shot!" "Look, here... see? Under 'Favourite Avenger girl'? I'm 4TH!" Where on earth did you find that picture? I've never seen it before. That's Ray Austin walking Joanna through Target! isn't it? You made my day, Dandy! Both pics were from Ray Austin's website. I thought so! I've got to go browsing again. Fabulous picture Never seen that one either! "Hello my dear, it seems you like brandy too, would you like to join me and play chess ?" I suggest this caption, sorry if it's not humorous. I tried. 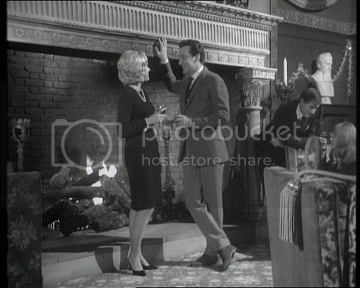 "So, I kneed the Butler in the nuts and now I'm holding up the entire fireplace - I'm the manliest man in the room. Dinner?"